Published January 22, 2017 at 256 × 384 in Carol Smeraldo. Carol Smeraldo. 2007. Ocean I. 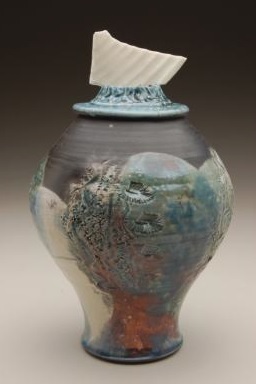 Covered raku jar with translucent porcelain fragment on sculptured lid. Carved and stretched. 21.5 x 15.2 cm. Photo: Stephen Hill, Center Street Clay, Chicago.